L. Alexander, “e-Navigation 101: What is it, Why important, and How should it Work?”, e-Navigtion Underway 2014 - North America. Califorina Maritime Academy, Vallejo, CA, 2014. L. Alexander, “e-Navigation: Some Core Technologies and Solutions”, 8th Seoul International Maritime Forum. Seoul, South Korea, 2014. S. Pe'eri, Parrish, C. E., Azuike, C., Alexander, L., and Armstrong, A. A., “Satellite Remote Sensing as a Reconnaissance Tool for Assessing Nautical Chart Adequacy and Completeness”, Marine Geodesy, vol. 37(3). Taylor & Francis, pp. 293-314, 2014. S. Lee and Alexander, L., “Software Quality Assurance in e-Navigation: Developing Standards to Harmonize Ship and Shore e-Navigation”, Sea Technology, vol. Volume 55, No. 1. pp. 46-48, 2014. S. Pe'eri, Parrish, C. E., Alexander, L., Azuike, C., Armstrong, A. A., and Sault, M., “Future directions in hydrography using satellite-derived bathymetry”, US Hydrographic Conference 2013. THSOA, New Orleans, LA, USA, 2013. S. Pe'eri, Madore, B., Alexander, L., Parrish, C. E., Armstrong, A. A., and Azuike, C., “LANDSAT 7 Satellite-Derived Bathymetry”, in The IHO-IOC GEBCO Cook Book, 2.25.13nd ed., vol. IHO Publication B-11 and IOC Manuals and Guides, 63, Monaco, Monaco Cedex, Monaco: International Hydrographic Office (IHO)/ International Ocean Commision (IOC), 2013. S. Pe'eri, Parrish, C. E., Alexander, L., and Armstrong, A. A., “Satellite-derived bathymetry: A reconnaissance tool for hydrography”, JALBTCX 14th Annual workshop. Mobile, AL, 2013. O. Fadahunsi, Pe'eri, S., Parrish, C. E., Armstrong, A. A., and Alexander, L., “Spectral characterization of the Nigerian shoreline using Landsat imagery”, US Hydrographic Conference 2013. THSOA, New Orleans, LA, USA, 2013. L. Alexander, “AIS Application-Specific Messages: Expectation and Reality”, Sea Technology, vol. 53, No. 3. p. 69, 2012. S. Pe'eri, Azuike, C., Alexander, L., Parrish, C. E., and Armstrong, A. A., “Beyond the Chart: The use of Satellite Remote Sensing for Assessing the Adequacy and Completeness Information”, 2012 Canadian Hydrographic Conference. Niagara Falls, Ontario, Canada, 2012. O. Fadahunsi, Armstrong, A. A., Pe'eri, S., Alexander, L., and Parrish, C. E., “Developing a Methodology for the Mapping and Characterization of the Nigerian Coastline Using Remote Sensing”, Canadian Hydrographic Conference 2012. Niagara Falls, Ontario, Canada, 2012. C. Azuike, Pe'eri, S., Alexander, L., Parrish, C. E., and Armstrong, A. A., “Development of a Geo-spatial Analysis Methodology for Assessing the Adequacy of Hydrographic Surveying and Nautical Charts”, 2012 Canadian Hydrographic Conference. Niagara Falls, Ontario, Canada, 2012. O. Fadahunsi, Pe'eri, S., Alexander, L., and Parrish, C. E., “Develping a Methodology for the Mapping and Characterization of the Nigerian Coastline Using Remote Sensing”, 2012 Canadian Hydrographic Conference. Niagara Falls, Ontario, Canada, 2012. G. Ringuette, Pelletier, S., Dagenais, D. A., and Alexander, L., “e-Navigation on the St. Lawrence River in Canada: Past, Present and Future”, e-Navigation Underway 2012. Copenhagen, Denmark, 2012. L. Alexander, “Maritime Information Systems as a Component of e-Navigation .”, The Radio Technical Commission for Maritime Services (RTCM). San Diego, CA, USA, 2010. L. Alexander, “Status Report on International Inland ENC Developmnet and Standardization”, The Radio Technical Commission for Maritime Services (RTCM). St. Petersburg Beach, FL, USA, 2007. H. Hecht, Kampfer, A., and Alexander, L., “the WEND Concept for Worldwide ENC Database - Past or Future: A Review of Progress and a Look to the Future”, International Hydrographic Review, vol. 8. Geomatics Information & Trading Center - GITC, Lemmers, Amsterdam, The Netherlands, pp. 73-79, 2007. K. Schwehr and Alexander, L., “Encoding AIS Binary Messages in XML Format for Providing Hydrographic-related Information”, International Hydrographic Review, vol. 8. Geomatics Information & Trading Center - GITC, Lemmers, Amsterdam, The Netherlands, pp. 36-57, 2007. R. T. Brennan, Gallagher, B., Riley, J., Schwehr, K., and Alexander, L., “Tide Aware ENC: Demonstration of an Operational Concept”, U.S. Hydrographic Conference (US HYDRO). Norfolk, VA, USA, pp. 0-0, 2007. A. Niles, Birklhuber, L., Alexander, L., Kluytenaar, P., and Sekachev, V., “European North American-Russian Federation Inland ENC Harmonization Group”, U.S. Hydrographic Conference (US HYDRO). Norfolk, VA, USA, 2007. K. Schwehr and Alexander, L., “Specification Format for AIS Binary Messages for Providing Hydrographic-related Information”, U.S. Hydrographic Conference (US HYDRO). Norfolk, VA, USA, pp. 0-21, 2007. L. Alexander, Brown, M., Greenslade, B., and Pharaoh, A., “Development of IHO S-100: The New IHO Geospatial Standard for Hydrographic Data”, International Hydrographic Review, vol. 8. Geomatics Information & Trading Center - GITC, Lemmers, Amsterdam, The Netherlands, pp. 56-62, 2007. 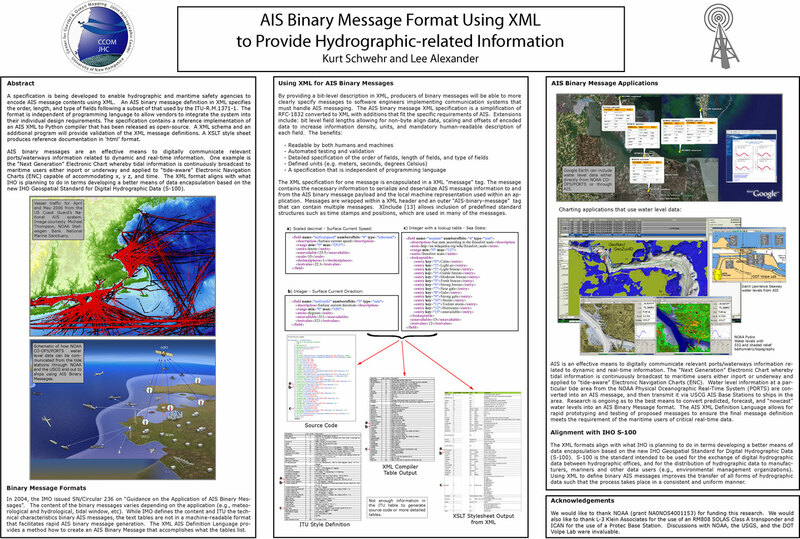 K. Schwehr and Alexander, L., “Proposed AIS Binary Message Format Using XML for Providing Hydrographic-related Information”, U.S. Hydrographic Conference (US HYDRO). Norfolk, VA, USA, 2007. L. Alexander, “Electronic Navigational Charts and Marine Information Objects for Navigation Safety and Marine Environmental Protection”, Commission on Hydrography Conference (CHC). Veracruz, Veracruz, Mexico, 2007. L. Alexander and Huet, M., “Relationship of Marine Information Overlays (MIOs) to Current/Future IHO Standards”, International Hydrographic Review, vol. 8. Geomatics Information & Trading Center - GITC, Lemmers, Amsterdam, The Netherlands, pp. 80-82, 2007. L. Alexander, Roman, D., and Casey, M. J., “Comparative Evaluation of Official Electronic Chart Data in U.S. Waters”, Canadian Hydrographic Conference (CHC). Halifax, Nova Scotia, Canada, 2006. L. Alexander, “Recommendation for Involving the Private Sector in Producing Small-scale ENCs from INT Charts”, University of New Hampshire (UNH), Center for Coastal and Ocean Mapping (CCOM)/Joint Hydrographic Center (JHC), 2006. H. Hecht, Berking, B., Buttgenbach, G., Jonas, M., and Alexander, L., The Electronic Chart. Functions, Potential and Limitations of a New Navigation System. Lemmers, Amsterdam, The Netherlands: Geomatics Information & Trading Center - GITC, 2006, p. 293. L. Alexander, “Electronic Charts: A Real-time GIS for Vessel Navigation”, GIS Professional. PV Publications Ltd, pp. 20-22, 2006. G. Dias, Coleman, D. F., El-Rabbany, A., Agi, B., and Alexander, L., “A Process for Producing Ice Coverage Marine Information Objects (MIOs) in IHO S-57 Format”, International Hydrographic Review, vol. 7. Geomatics Information & Trading Center - GITC, Lemmers, Amsterdam, The Netherlands, pp. 55-63, 2006. L. Alexander, “Proposed Test Bed Project on Production of Large-scale ENCs in the MACHC Region”, University of New Hampshire (UNH), Center for Coastal and Ocean Mapping (CCOM)/Joint Hydrographic Center (JHC), 2006. L. Alexander, “North American European Inland ENC Harmonization Group: Building on IHO S-57 for an International Brownwater Standard”, The Radio Technical Commission for Maritime Services (RTCM). St. Andrews, New Brunswick, Canada, pp. 0-0, 2005. L. Alexander, Brown, M., Greenslade, B., and Pharaoh, A., “Future Edition of IHO S-57 (4.0)”, International Hydrographic Review, vol. 6. Geomatics Information & Trading Center - GITC, Lemmers, Amsterdam, The Netherlands, pp. 66-72, 2005. L. Alexander, Brown, M., and Greenslade, B., “Next Edition of IHO S-57 (Edition 4): Much more than ENCs”, U.S. Hydrographic Conference (US HYDRO). San Diego, CA, USA, pp. 0-0, 2005. L. Alexander, “Inland ENC Encoding Guide”, University of New Hampshire (UNH), Center for Coastal and Ocean Mapping (CCOM)/Joint Hydrographic Center (JHC), 2005. L. Alexander and Ries, K. L., “Coral Reef Electronic Chart Initiative, Protecting Corals, Saving Ships”, U.S. Hydrographic Conference (US HYDRO). San Diego, CA, USA, pp. 0-0, 2005. L. Alexander, “Activities of IHO-IEC Harmonization Group on Marine Information Objects (HGMIO)”, International Hydrographic Office (IHO), CHRIS, 2004. L. Alexander, Ryan, J. F., and Casey, M. J., “Integrated Navigation System: Not a Sum of Its Parts”, Canadian Hydrographic Conference (CHC). St. Andrews, New Brunswick, Canada, pp. 0-0, 2004. L. Alexander, “Hydrographic Interoperability Report”, Marine Magnetics, 2004. L. Alexander, “Revival of ECDIS?”, Hydro International, vol. 8. Geomatics Information & Trading Center - GITC, Lemmers, Amsterdam, The Netherlands, pp. 34-35, 2004. L. Alexander, “Inland ECDIS Development and Standardization”, International Hydrographic Office (IHO), CHRIS, 2004. H. H. Lanziner and Alexander, L., “Inland ECS: More than just ECDIS in Montreal Canada”, The Radio Technical Commission for Maritime Services (RTCM). St. Andrews, New Brunswick, Canada, pp. 0-0, 2004. L. Alexander, “Open ECDIS Forum (OEF) Activities”, International Hydrographic Office (IHO), CHRIS, 2004. L. Alexander, “The Next Edition of IHO-S-57 (4.0)”, International Hydrographic Bureau, 2004. H. H. Lanziner, Alexander, L., Ringuette, G., and Virnot, A. D., “Automatic Radar Positioning as a Backup to DGPS”, The Radio Technical Commission for Maritime Services (RTCM). St. Andrews, New Brunswick, Canada, pp. 0-0, 2004. F. Motz, Widdel, H., Oei, P., Mackinnon, S., Patterson, A., and Alexander, L., “Investigations for Ergonomic Presentation of AIS Symbols for ECDIS”, International Hydrographic Review, vol. 5. Geomatics Information & Trading Center - GITC, Lemmers, Amsterdam, The Netherlands, pp. 26-36, 2004. F. Motz, Widdel, H., Oei, P., Mackinnon, S., Patterson, A., Baldauf, M., and Alexander, L., “Investigations for Ergonomic Design of AIS Symbols for ECDIS”, U.S. Army, U.S. Army Corps of Engineers / Topographic Engineering Center (TEC), 2004. D. H. Smith, Alexander, L., and Van Norden, M. F., “A World Class ECDIS Laboratory”, Hydro International, vol. 7. Geomatics Information & Trading Center - GITC, Lemmers, Amsterdam, The Netherlands, pp. 7-9, 2003. L. Alexander, Brennan, R. T., and Moggert, F., “Converting High-Density Bathymetry into the 'Next Generation' ENC”, Shallow Water Survey Conference (SWS). St. Andrews, New Brunswick, Canada, pp. 0-0, 2003. L. Alexander and Casey, M. J., “The Rise and Stall of ECDIS: Where are We heading?”, International ECDIS Conference. Singapore, Singapore, Singapore, pp. 0-0, 2003. L. Alexander, “A Synopsis of Electronic Charting Standards and Organizations, with Recommendations for U.S. Army Corps of Engineers Involvement”, U.S. Army, U.S. Army Corps of Engineers / Topographic Engineering Center (TEC), 2003. L. Alexander and Klutenaar, P., “Harmonization of European and North American Inland ECDIS Standards”, International ECDIS Conference. Singapore, Singapore, Singapore, pp. 0-0, 2003. D. H. Smith and Alexander, L., “Joint USM-NAVOCEANO ECDIS Laboratory”, International ECDIS Conference. Singapore, Singapore, Singapore, pp. 0-0, 2003. L. Alexander, “Electronic Charts (Chapter 14)”, in The American Practical Navigator, Bethesda, MD, USA: National Imaging and Mapping Agency, 2003, pp. 199-215. L. Alexander, “Marine Information Objects (MIO) and ECDIS: Concept and Practice”, Underwater Acoustic Measurements: Technologies & Results (UAM). Heraklion, Crete, Greece, pp. 0-5, 2003. L. Alexander and Ward, R. W., “We Visited for You - 2nd International ECDIS Conference”, Hydro International, vol. 7. Geomatics Information & Trading Center - GITC, Lemmers, Amsterdam, The Netherlands, pp. 0-38, 2003. L. Alexander, “Insiders View-overcoming a Misperception”, Hydro International, vol. 6. Geomatics Information & Trading Center - GITC, Lemmers, Amsterdam, The Netherlands, pp. 65-65, 2002. L. Alexander, “Distribution Options Based on WEND”, Gulf of Mexico Hydrographic Commission, Electronic Chart Working Group, 2002. L. Alexander, “Chapter 14 - Electronic Charts”, in The American Practical Navigator, 9th ed., Bethesda, MD, USA: National Imaging and Mapping Agency, 2002. L. Alexander, “NATO Warship ECDIS and Additional Military Layers (AMLs)”, CARIS. Norfolk, VA, USA, pp. 0-0, 2002. L. Alexander and Ward, R. W., “Back-up Arrangements for ECDIS: Different Options and Perspectives”, Canadian Hydrographic Conference (CHC). Toronto, Ontario, Canada, pp. 0-0, 2002. S. M. Smith, Alexander, L., and Armstrong, A. A., “The Navigation Surface: A New Database Approach to Creating Multiple Products from High-Density Surveys”, International Hydrographic Review, vol. 3. Geomatics Information & Trading Center - GITC, Lemmers, Amsterdam, The Netherlands, pp. 12-16, 2002. D. Brunt, Alexander, L., and Barbor, K., “An ECDIS Lab: Facilitating Electronic Charting for Navy Missions”, Canadian Hydrographic Conference (CHC). Toronto, Ontario, Canada, pp. 0-0, 2002. L. Alexander, “Harmonizing the Display of ECDIS and AIS information”, Workshop by National Academy of Science (NAS). New Orleans, LA, USA, pp. 0-0, 2002. L. Alexander, “Status of Electronic Charting Standards”, GEOMATICA. Havana, Havana, Cuba, pp. 0-0, 2002. D. E. Wells, Richer, J., Santos, M., Dare, P., Allen, I., Wiesenburg, D., Dodd, D., Howden, D., Davis, J., Armstrong, A. A., Dijkstra, S. J., Alexander, L., Monahan, D., Chance, J., and Fruge, F., “Open Access Learning at Sea”, Canadian Hydrographic Conference (CHC). Toronto, Ontario, Canada, pp. 0-0, 2002. L. Alexander, “SHARED Project: Extension to Caribbean - Gulf of Mexico Region”, NH Sea Grant College, 2002. L. Alexander and Smith, D. M., “Warship ECDIS and additional Military Layers (AMLs)”, IEEE Oceans. Biloxi, MS, USA, pp. 0-0, 2002. L. Alexander, “Alternative Uses of Hydrographic Data”, IHO Industry Workshop. Monaco, Monaco, Monaco, pp. 0-0, 2002. L. Alexander and Buttgenbach, G., “From High Density Bathymetry to Next Generation ENC”, International Conference on High-Resolution Survey in Shallow Water (HRSSW). Portsmouth, NH, USA, pp. 0-0, 2001. H. Hecht, Berking, B., Buttgenbach, G., Jonas, M., and Alexander, L., The Electronic Chart: A Revolution in Marine Navigation. Lemmers, Amsterdam, The Netherlands: Geomatics Information & Trading Center - GITC, 2001. L. Alexander and Brennan, R. T., “From High-Denisty Bathymetry to Next Generation ENC”, International ECDIS Conference. Singapore, Singapore, Singapore, pp. 0-0, 2001. L. Alexander, “Simultaneous Display of Chart and Navigation-related Information”, AIS: Maritime Communication in the New Era. St. Andrews, New Brunswick, Canada, pp. 0-0, 2001. L. Alexander, “Oyster River Project: Mapping of Historic and Present Navigation Channel: Interim Report”, US Army Corps of Engineers(USACE), 2001. L. Alexander, Van Norden, M. F., and Fralick, C. M., “ECDIS Development Laboratory and Navigation Technology Demonstration Center”, IEEE Oceans. Honolulu, HI, USA, pp. 0-0, 2001. L. Alexander, “Harmonizing Chart and Navigation-related Information on ECDIS”, International Hydrographic Review, vol. 2. Geomatics Information & Trading Center - GITC, Lemmers, Amsterdam, The Netherlands, pp. 0-13, 2001. L. Alexander, “ECDIS and ENCs: Where are We Heading?”, CARIS. San Diego, CA, USA, pp. 0-0, 2001.